In this Sept. 8, 2003, file photo, the Canadian flag flutters in the breeze by the lighthouse at Machias Seal Island. This area is part of "The Gray Zone" in the waters between the two countries. U.S. Border Patrol agents have reportedly been checking boats in the area for undocumented immigrants. The Canadian government is investigating reports that U.S. Border Patrol agents stopped Canadian fishing boats while searching for undocumented immigrants in disputed waters off the coast of Maine that Canada has considered its own, NBC News reported. 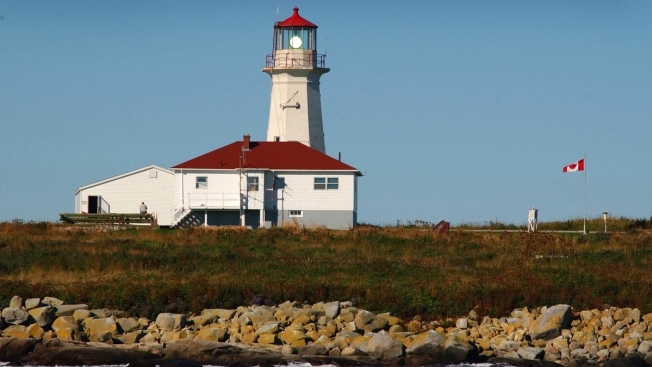 Laurence Cook, a member of the Grand Manan Fishermen's Association, said in a Facebook post that, in a June 24 boat check off the Machias Seal Island "grey zone" in late June, Border Patrol agents claimed "to be looking for illegal immigrants." The fishermen's association confirmed on Facebook that "a few Grand Manan Fisherman were approached" by Border Patrol agents in June. There have been at least two such stops, and as many as 10 in recent weeks, according to the Canadian state media outlet, CBC News. A spokeswoman for Canada's diplomatic and consular agency said it is looking into the matter. A U.S. Customs and Border Protection spokeswoman confirmed the encounters and said they are routine.